SINGAPORE, 10 April 2017 – Guide Dogs Association of the Blind (GDAB) today announced receiving a one-year sponsorship from Scoot-Tigerair that will benefit the visually-impaired community in Singapore. As part of the agreement, Scoot-Tigerair has committed to sponsoring six return flights between Australia and Singapore from April 2017 and March 2018 to help GDAB strengthen its training capabilities and bring more guide dogs into Singapore. GDAB has been in partnership with Guide Dogs Victoria in Melbourne, Australia, from whom they procure their guide dogs, since 2011. To date, there are a total of eight guide dogs in Singapore, of which six were brought into Singapore by GDAB. The organisation is also looking to send candidates to Australia for Guide Dog Mobility and Orientation & Mobility training course through this sponsorship. Scoot-Tigerair is one of the first Singapore-based airlines to allow certified guide dogs on board and has a team of cabin crew trained to assist visually-impaired passengers. Prior to the sponsorship, the airline had accommodated the transfer of two guide dogs from Australia in June 2016 and March 2017. “We are delighted and most grateful to receive this sponsorship from Scoot-Tigerair in support of our work to provide visually impaired Singaporeans with guide dogs. With Scoot-Tigerair’s experience in transferring guide dogs, it will not only ease the cost of transfer but also ensure the process seamless and stress-free. 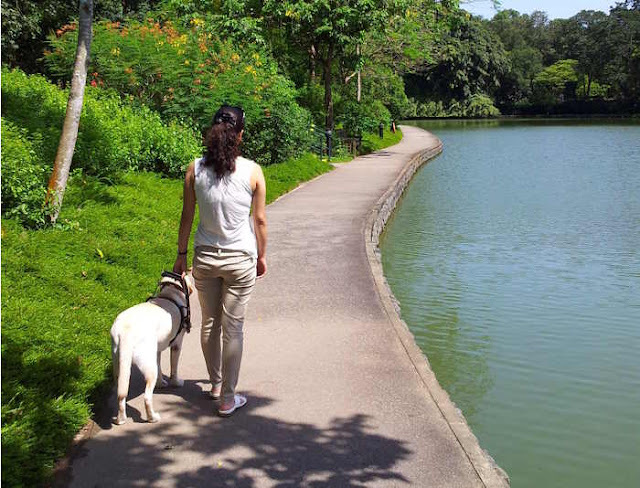 In recent years, we have observed greater acceptance towards guide dogs and also improved accessibility in public places and we look forward to forming more guide dog teams in Singapore,” said Ms Lee Sutton, Vice-Chairman of GDAB. “Scoot and Tigerair are happy to support GDAB’s effort to enhance the mobility of the visually impaired in our community. This is in line with our brand DNA to empower our guests to embark on exciting travel adventures. We will continue our efforts to improve our capabilities to assist customers with special needs,” said Leslie Thng, CCO of Scoot and Tigerair. Guide Dogs Association of the Blind Ltd (GDAB) is a non-profit voluntary welfare organisation founded in 2006. It focuses on enhancing the quality of life for blind and visually-impaired people in Singapore through the provision of training and rehabilitation programme such as Orientation & Mobility and Guide Dogs Programme. The organisation also actively advocates for an inclusive society where every blind and visually-impaired person is empowered for independent living. Till date, GDAB has served more than 200 blind and visually-impaired people and has successfully paired four Guide Dog teams. GDAB is an associate member with the National Council of Social Service (NCSS) and holds the Institute of Public Character status. For more information on GDAB, please visit www.guidedogs.org.sg. To make a donation, please visit www.give.asia/charity/guide_dogs_association_of_the_blind_ltd. Tigerair is the low-cost, short-haul arm of the Singapore Airlines Group managed by Budget Aviation Holdings. Established in 2004, Tigerair is a leading Singapore-based no-frills airline that offers affordable travel options and a seamless customer experience. With a fleet of Airbus A320-family aircraft, Tigerair operates flights to 40 destinations across Asia including Singapore, Bangladesh, China, Hong Kong, India, Indonesia, Macau, Malaysia, Maldives, Myanmar, Philippines, Taiwan, Thailand and Vietnam. Tigerair empowers travellers to explore new destinations, and accumulate memorable experiences, by offering an increased network of destinations. It is also committed to maintaining the highest standards of safety, security and reliability. For more information, please visit www.tigerair.com.